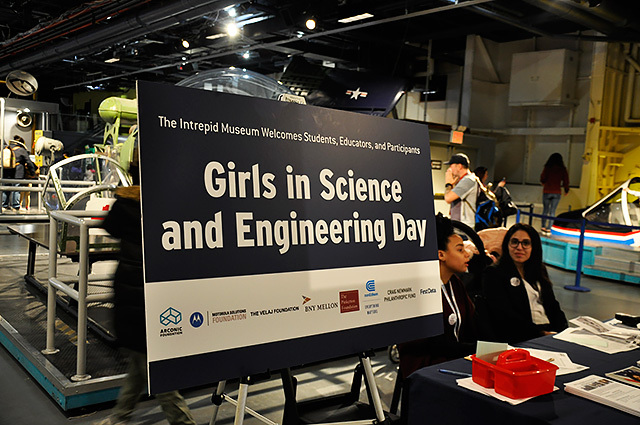 A small robotic unicorn roamed the floor during the fifth annual Girls in Science and Engineering Day at the Intrepid. 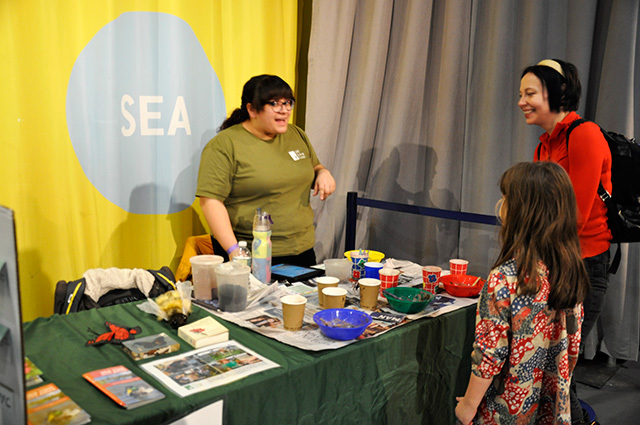 Girls at event learned about science and engineering with a day of demonstrations, hands-on activities and presentations from local organizations like the LES Ecology Center. In museum’s Exploreum, kids could lie on the mock sailor bunk beds, fly a plane on a flight simulator, or put their hands through large space gloves to complete small tasks. There were short sessions throughout the afternoon in the Pop-up Planetarium where guests learned about space and traveling to the moon. Kids gasped in amazement as they watched the projection of space move around overhead and chimed in when they knew the answers to questions. The main attraction of the event was the companies that set up tables across the floor. 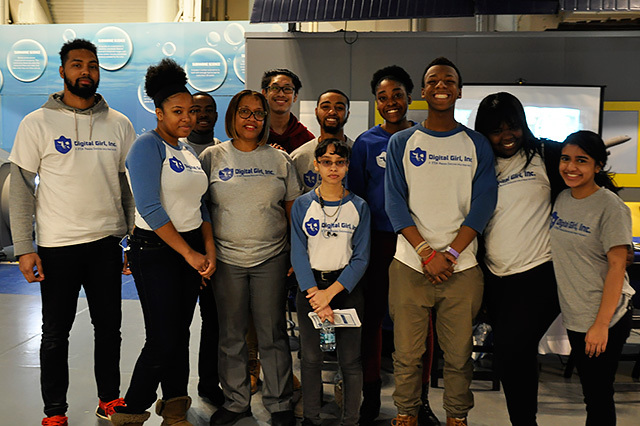 They invited attendees of all ages to participate in demonstrations and learn more about how their programs can help kids get involved in the fields such as coding, robotics and ecology. Nicolle Martinez, 21, an environmental educator for the LES Ecology Center, discussed compost and plants. At her table, guests were able to create seed balls using dirt and crushed up seeds found in New York. They were encouraged to plant them in their neighborhoods to hopefully grow some foliage. 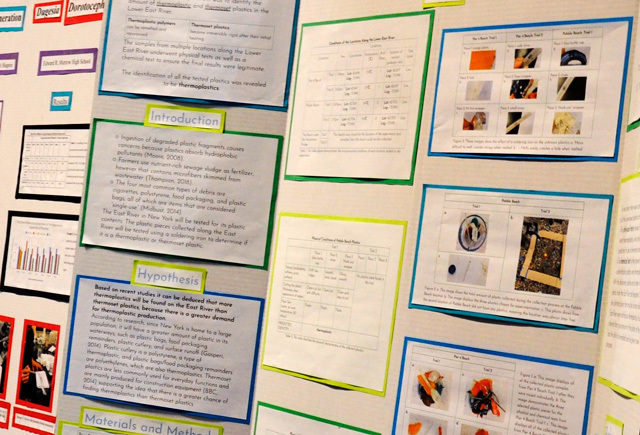 Martinez has worked with groups, such as the Boys Scouts and Girls Scouts, church groups and other public schools to help expose children to science. “I think my favorite part is really being able to see different populations come together to not just celebrate the participation of women and girls in science and engineering, but to help reach out to populations who haven’t already been exposed to it,” she said. Troy Slade, a 14-year-old high school student from Elizabeth, New Jersey, has been to several different STEM events but she liked the one at the Intrepid Museum because she believes that more female empowerment is needed. She was interested in the LES Ecology Center table because of her gardening hobby. “I’ve been gardening for a year now, but learning from people who have experience and people who own different organizations is really just an eye opener,” she said. One of the STEM topics covered at the event was coding. Toni Robinson, 55, the President of Digital Girl Inc., and her staff gave children five-minute lessons on what it was like to code. They gave those who came by a couple of sheets which detailed the statistics of how many women, particularly minority women, work in STEM areas. Added by Christine Mckenna on March 27, 2019.